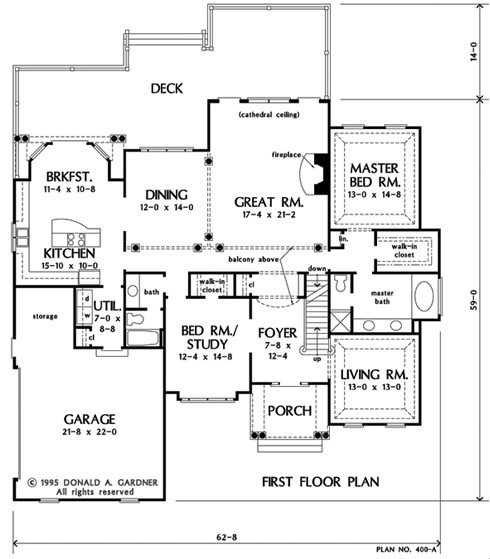 An enlarged version of our plan # 399, this home maintains an open, flowing plan and its front and rear good looks. Enter the welcoming foyer and continue to the versatile bedroom/ study, the formal living room expanded by a tray ceiling, or up to the second floor balcony that overlooks the great room. Or, proceed through the colonnaded great room and linger on the relaxing deck. 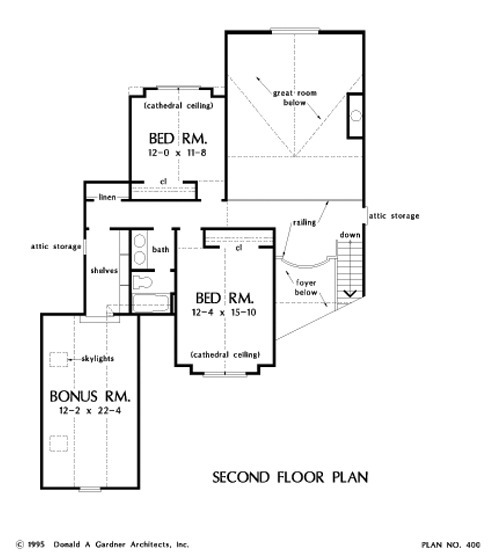 Downstairs, the secluded master suite features a tray ceiling in the bedroom for volume and interest. A garden tub with a picture window is the focal point of the master bath while a spacious walk-in closet finishes the retreat. 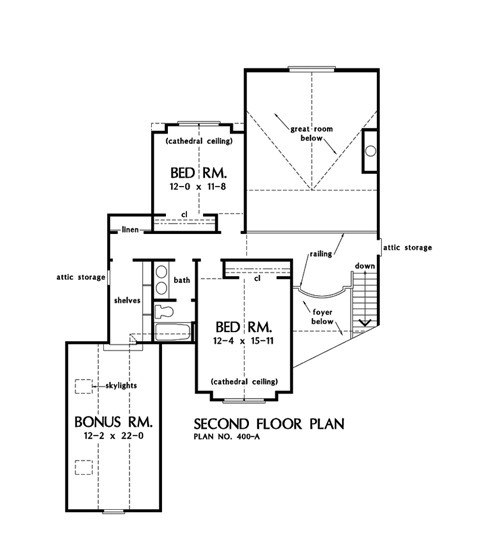 Upstairs, two bedrooms, highlighted by cathedral ceilings, share a full bath. Storage abounds in the attic and skylit bonus room. 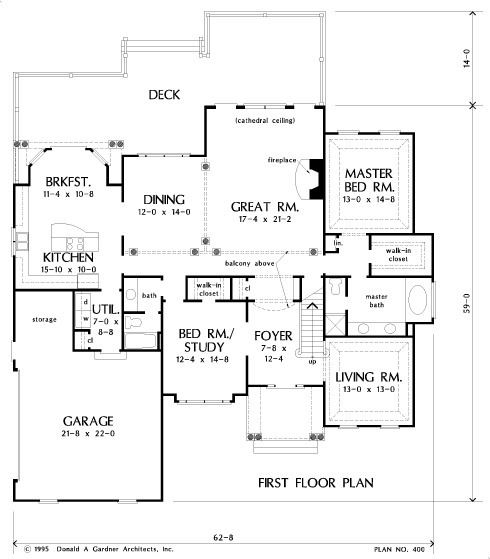 House Dimensions: 62' 8" x 59' 0"
Great Room: 17' 4" x 21' 2"
Foyer (Vaulted): 7' 8" x 12' 4" x 17' 1"
Great Room (Cathedral): 17' 4" x 21' 2" x 17' 2"
Breakfast Room : 11' 4" x 10' 8" x 8' 0"
Utility Room : 7' 0" x 8' 8" x 8' 0"
Bonus Room (Vaulted): 12' 2" x 22' 0" x 9' 0"
Garage Storage : 8' 6" x 9' 0" x 0' 0"
Master Bedroom (Tray): 13' 0" x 14' 8" x 9' 5"
Bedroom / Study : 12' 4" x 14' 8" x 8' 0"
Bedroom #2 (Cathedral): 12' 4" x 15' 10" x 15' 11"
Bedroom #3 (Cathedral): 12' 0" x 11' 8" x 15' 11"
Porch - Front : 11' 7" x 7' 0" x 0' 0"
Living Room (Tray): 13' 0" x 13' 0" x 9' 5"
Storage (1st Fl.) : 3' 2" x 8' 8" x 0' 0"